Sankei: Was a united front towards China demonstrated? 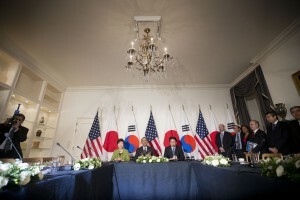 On March 31, for the first time in two years a trilateral meeting was held in Washington between Japan, South Korea, and the USA’s heads of state. With North Korea’s escalating military provocations, such as nuclear tests and missile launches, the three nations agreed to increase trilateral security cooperation. On April 2, the Yomiuri, Mainichi, Nikkei, and Sankei carried editorials about the summit, all of which welcomed increased cooperation between Japan, South Korea, and the USA. However, they mentioned the issue of no concrete progress having been made on security cooperation between Japan and South Korea, and all four papers suggested the General Security of Military Information Agreement (GSOMIA) be concluded as soon as possible. One common theme among the four papers was a call to conclude the General Security of Military Information Agreement (GSOMIA) as soon as possible, which had been unilaterally delayed by South Korea in June 2012 right before signing, due to South Korea’s domestic situation. This is clearly a reflection of a shared understanding that in order to deal with North Korea, nothing is more vital than stable improvement in relations between Japan and South Korea. The Sankei alone also argued for the necessity of a united front against China from the trilateral summit. *English translations of The Yomiuri and The Mainichi are from The Japan News and The Mainichi, respectively. Those for The Nikkei and The Sankei are provisional. The content of this page was made by the Foreign Press Center Japan and does not reflect the opinion of the Japanese Government or any other organization.